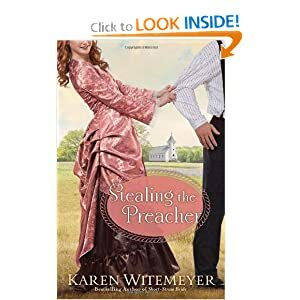 I recently finished reading a fabulous new release, Stealing the Preacher by Karen Wittemeyer. I had no idea this was an old west type of story, and had I not promised to do a review, I might not have picked up the book. What a HUGE mistake that would have been. Right from the beginning action leads the way and it doesn't stop unit the last word. Crockett Archer knows the Lord called him to be a preacher. He gathers a few things and boards the train to the new church requesting his presence at an interview. Along the way bandits h0ld up the train refusing to take any money or jewelry. So what do they want? The new parson on the train. Hog tied and forced to ride to the hideout, Crockett watches time tick by with the movement of the sun, knowing he'd be late for his interview. Joanna Robbins asks her daddy to bring a preacher, but she had no idea he would don his old bandit clothes to deliver her birthday present. He orders his gang members to haul the preacher down off the horse and proudly shows off his gift to his daughter. Joanna apologizes to the preacher and leads him to the abandoned church, explaining her true wishes. She hopes he will stay and take over the church, after all, her daddy needs to hear about God from a real preacher man. Joanna secretly promised to carry on her momma's passion to introduce Daddy to Jesus. Humor, true love, shootin', horse races, a grand community picnic complete with white washing the church building are only a small piece of this entertaining story. Of course Crockett's is a man any girl would swoon for, mostly because of his handsome features and his display of a proper Christian heart. In fact, the whole community takes no time to form a liking to Crockett. All would have been just fine since Crocket accepted the Lord's plan to miss out on the job of a life time until Miss Holly Brewster, local beauty queen at Joanna's church aimed to cause terrible mischief. If you could see me writing this post, you would find my hand restraining my lips from spilling the most fantastic ending ever. I can at least tell you the pages of your copy will fly to the end. Few books offer such an unexpected twist at the end of the story and then boldly end in the way the reader expects. This story not only will go beyond your expectations, but tempt you to read it again. Whether you are an old west reader or not, Stealing the Preacher is a book sure to please. I only have an advanced readers copy, or I'd gladly do a book give away. Since I can't, I will encourage you to get a copy and tell us what you think. Am I right about this book? I am confident there will be a resounding YES! Yes, you are right, Mary! I loved this book as well. If you haven't read the first book about the Archer brothers, Short-Straw Bride, I urge you to read it. It's quite fun as well and introduces you to the brothers. I've read most of Karen's books and loved them all. I foresee some great brother banter with a spice of family support. Oh yes, and a heap a lot of laughter.